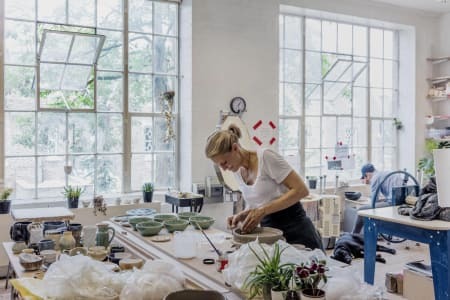 SkandiHus was founded by the Danish ceramicist, Stine Dulong, who works and lives in London. When Stine is not busy making her own designs, she teaches classes from her studio in De Beauvoir in Hackney. Stine both throws and hand-builds her pieces. It is very important to her to minimise her impact on the world in which she lives, so she reuses materials whenever possible and many of her pieces are made from reclaimed waste clay from her students and fellow studio members.